After constantly searching for ways to find balance in my own life, I realized that things didn’t need to be as complicated as I made them. I started to pay more attention to the connection between my mind, body, and soul; and I discovered what a powerful role these elements play in our overall well-being. I created Erin Nicole Yoga to share the framework and daily process I used to go from burned out to balanced. I am proud to teach others and share the tools to live a life that nourishes balance, inspires intention and harmonizes the physical, mental and spiritual aspects of your being. Erin Nicole Yoga specializes in corporate and private yoga instruction. Instructors come to your home, office or event and offer an exceptional yoga experience that caters specifically to you. “Am I good at my job? – Definitely." Fearful of the risks and hesitant to truly pause and listen to my intuition, I resisted. I allowed myself to be confined by circumstance, and continued to stifle my desire for deeper meaning and connection in my work. I decided to set small intentions and take steps towards finding my true purpose. These small steps led me to explore holistic lifestyle habits, try on plant-based eating, and take more Yoga– a lot of Yoga. Simple weekly intentions turned into daily practices and ultimately transformed my life and my career. I transitioned away from a full-time marketing career to pursue my passion as a business owner, Yoga teacher and holistic lifestyle consultant. Initially driven to inspire others through my own personal transformation, I ultimately found another layer of satisfaction in my work. Everyday it is a privilege to serve others and watch lives transform from a state of pure existence to the embodiment of purpose. To become your most authentic self, it starts with intention. Through intention setting we connect with our true passions and ultimately manifest the energy and experiences that weave together to inspire the beautiful intricacies of our lives. Whether your intention is simple or complex, a daily intention to live mindfully changes your perspective and empowers you to live your truth. 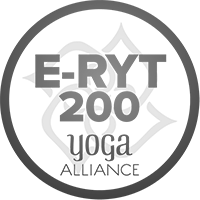 Erin is an ERYT 200 HR Yoga Teacher, with advanced Vinyasa training and restorative yoga certifications obtained through CorePower Yoga. 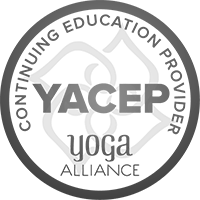 Erin is also a YACEP, Yoga Alliance Continued Education Provider. Erin is CPR/AED certified and insured. Erin also completed the AFPA holistic nutritionist certification program, with an emphasis on vegetarianism and athletic performance.